Director James Cameron has teamed up with Cirque Du Soleil to create a touring arena show based on his 3D blockbuster Avatar. The show is expected to begin a global tour in late 2015, before the release of three Avatar sequels currently in pre-production. The award-winning 2009 epic is Hollywood's highest grossing film ever. Cameron previously worked with Cirque Du Soleil in 2012, executive producing its 3D film Worlds Away. "Over the years, I have discovered the extraordinary talents and imaginations of both the artists and the creative forces behind Cirque du Soleil," said Cameron. "I know we share the common goal of bringing audiences to another level of entertainment experiences. I look forward to doing just that on this project." 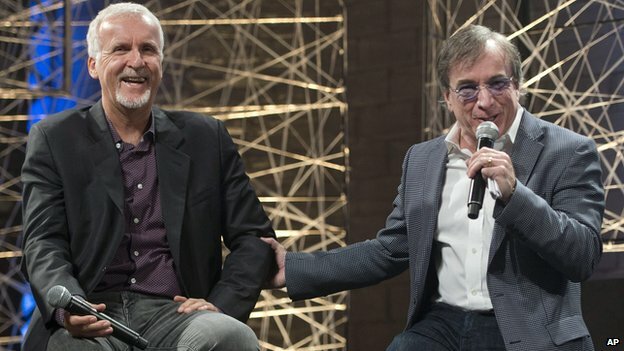 He and Cirque Du Soleil president and CEO Daniel Lamarre announced their plans at the C2MTL-Commerce and Creativity Conference in Montreal. Lamarre said he was "thrilled" the circus company was getting to "explore the very inspirational Avatar realm for the live stage". The live show is going to be a co-production between Cameron and Jon Landau's company Lightstorm Entertainment, Cirque Du Soleil and Twentieth Century Fox which financed and distributed Avatar. "Avatar remains a phenomenon that continues to inspire people around the globe, and combining it with the live event ingenuity of Cirque de Soleil is a perfect synthesis of imagination and talent," said the film company's chief Jim Gianopulos. Avatar has made $2.7bn (£1.6bn) worldwide and been awarded three Oscars, two Baftas and two Golden Globes. Both Sam Worthington, who playS former marine Jake Sully, and Zoe Saldana, who is Na'vi huntress Neytiri, are returning for the sequels.